An escaped prisoner learns that a second chance isn’t always as it seems in this classic film from world renowned auteur Jean-Pierre Melville. A trio of prisoners have escaped and the only survivor is Gustave “Gu” Minda, a mobster who works for longtime crime boss Paul Rizzi. Deciding to reunite with his love Manouche, he heads to Paris. While he is happy to reunite with his love, he is forced back into the gang and kills a police officer as a result. Blot, a highly respected inspector, is aware of Minda’s return and intends to find him. Meanwhile, knowing his life could be put to an end, Gu decides to leave the country with Manouche. However, he doesn’t have enough money. Orloff, a highly respected gangster who is friends with Paul, offers Gu the chance to pull off a major heist, to which he agrees. However, while the heist has been pulled off, Gu finds himself the unwitting pawn of a double cross that comes from a corrupt inspector, Fardiano. Gu must clear his name and at the same time, attempt to avoid Blot, who is convinced that Gu was behind the entire heist to begin with. Jean-Pierre Melville is one of the greatest auteurs of the modern gangster genre. While I am not particularly fond of French New Wave, especially those with unclear endings, Melville tends to use a more realistic approach to his films in terms of executing the story with how a story should be told: a beginning, a middle, and an end. While some will see that the film drags in the middle, it is however, essential that we get a full understanding of the characters. In some cases, editing to keep pacing can tend to leave plot holes and continuity could have its errors. However, Melville does the opposite with this film, a cat-and-mouse game between an escaped prisoner looking for a second chance at life and the inspector whose convictions that said prisoner is responsible for everything gone wrong in the film. The characters seem to have a complexity yet the message is clear: there are no real good guys in this film. The lead character of Gu is an unsympathetic anti-hero who gets back into the game after his escape and despite showing somewhat of a soft side when it comes to Manouche, finds himself unwittingly forced to double cross his boss all because of a double cross. The first two acts serve as the set up for what Gu experiences upon his attempt to get his second chance, only to see it fall and how he must try to redeem himself. This role is well played by Lino Ventura, who keeps a smug face throughout practically the entire film. Paul Meurisse brilliantly plays Blot, the inspector whose convictions and ego gets the best of him as he has only purpose in the film: take out Gu, even when he doesn’t get all the facts. Paul Frankeur plays Fardiano, the dirty cop who is only partly responsible for setting up for Gu’s eventual fall while the mastermind is someone involved within Rizzi’s gang, all because they’d rather see the elder Rizzi fall from grace and have him replaced. Christine Fabréga is great as Manouche, Gu’s love interest who because of her ties to him, has some sort of power when it comes to her business. However, she too longs for a second chance with Gu. However, one can only guess with this genre of cinema, how this will fare out in the end. 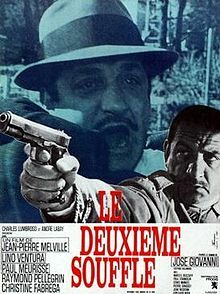 La Deuxiéme Souffle is one of Melville’s finest works that brings a necessarily complex cat-and-mouse story between an escaped prisoner and the investigator whose ego gets the best of him, with many connecting storylines mixed in, hence the two-and-a-half hour running time. But it’s a damn good two-and-a-half hours. A Les Productions Montaigne production. Director: Jean-Pierre Melville. Producers: André Labay and Charles Lumbroso. Writers: Jean-Pierre Melville and José Giovanni; based on the novel “Un reglement de comptes” by Giovanni. Cinematography: Marcel Combes. Editing: Monique Bonnet and Michèle Boëhm. Cast: Lino Ventura, Paul Meurisse, Raymond Pellegrin, Christine Fabréga, Marcel Bouzuffi, Paul Frankeur, Denis Manuel, Michel Constantin, Pierre Zimmer, Pierre Grasset.